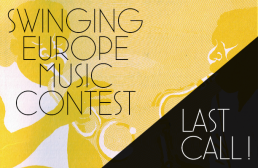 The European Swing Music Contest is about to end! On October 31th the call for entries will close and our jury will begin to choose the 4 winning bands that will perform in Festival Marckolswing (France), Seville Swing Festival (Spain), Sofia Swing (Bulgaria) and Swing on the Beach (Italy). You still have time to apply: click here to read the terms and conditions.